Gîtes for family holidays or place to party in the middle season. House of 185 m2 located on 3 ha shared with another house of 80 m2 very quiet in the countryside. With swimming pool of 5 m X 9.5 m heated (from early April to mid September) with a solarium of 150 m2 not overlooked. This house equipped luxury, secured by video surveillance (parking, swimming pool, land) is equipped with apparatus (swing, slide, trebuchet, sandbox, bowling, ping-pong, badminton, volleyball, ...) barbecue, living room garden, sunbed. Possibility to rent another house for 8/10 people simultaneously, bringing to 24 people (+2 babies) capacity. Possibility of wedding organization, baptism, communion, bachelor party, birthday, speed dating or any other event with barnums. Secure parking for 50 cars. Optional fee: sauna, gym, linen rental, organization of seminars, evening or festive event. In low and middle season: guest rooms and tables of hosts on reservation. Hairdressing and babysitting service at home. This year we celebrate our 20 years in SCI of the White Queen and our domain! Thank more than 15 000 customers who came to spend a relaxing weekend or holidays and all the families that come to flourish and be entertained during school holidays, many of whom return each year and some have become real friends. And looking forward to seeing you again this year! 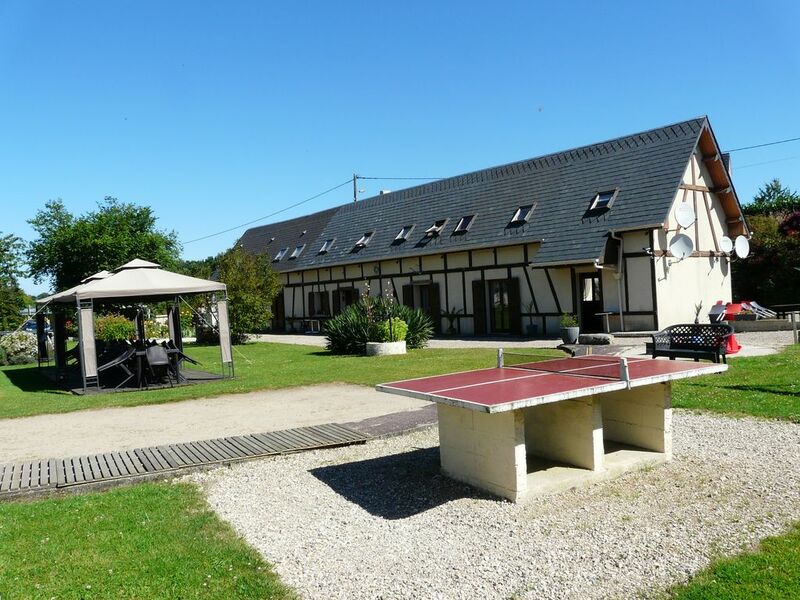 Located 17 km from the beach of Quiberville (sandy) and Dieppe (roller) with a thalassotherapy, its castle with its collection of ivory, its sea museum, casino and also disco, cinema, bowling etc .... A 2 km from the park 'Tree', 2 km from a free tennis court, 20 km from the amusement park and zoo Clères, 5 km of runs of the saw in a canoe, 7 km of Muchedent ( 1 Park 'photo safari' bison and deer (over 500 units)). In the region many markets are present to offer their local products or the sea. Large supermarket at 3 and 7 km. Shopping center 15 km away.